You've found the smartest way to book Puerto Rico vacations. Click a price below to see our unique vacation grid. It's very fast and has a calendar format for easy comparison. Our agents have been to most resorts - call us and we'll help you decide which hotel is right for you. It’s not just sand and surf that make up this interesting Caribbean archipelago. The small land is an undiscovered treasure, full of natural beauty and vibrant culture. Its beautiful beaches attract visitors staying in resort hotels, but there is so much more to be discovered. Explore rainforest marine life on a catamaran cruise or snorkeling tour. Spot birds in the lush forests and view the colourful coral reefs, tropical fish, and limestone caves. Puerto Rico is a blend of modern and historical features. There’s museums, art galleries, boutiques, and casinos. But you’ll also find old rum distilleries, wood carvings, colonial architecture, traditional salsa beats, and energetic fiestas. The distinctive capital city of San Juan is known for its gritty authenticity as an historical European-founded settlement. It features small restaurants, design shops, and bustling traffic of locals and tourists. Nonetheless, Puerto Rico vacations are characterized by the country’s beaches- having some of the world’s best- Puerto Rico provides an exciting vacation full of both culture and repose. Getting Around: Arrive at the Aeropuerto Luis Munoz Marin (SJU) in San Juan. Our travel agents can help you find and book flights to Puerto Rico. The city is a largely popular cruise ship port and is accessible by boat. There are also buses and taxis available. Visitors can rent a car and drive carefully around the countryside but driving in the city isn’t recommended because it’s hard to navigate through traffic and find parking. 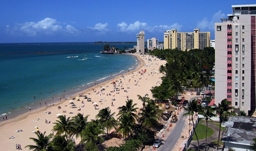 Where to Stay: Choose a hotel in Puerto Rico such as the Caribe Hilton or the Sheraton Old San Juan Hotel. Find a location on the beach or in the city to suit your budget and preferences. Weather: Puerto Rico weather is fairly consistent. Temperatures range from 22C to 30C. The highest hurricane risk is during September and October. Experience the exotic on a Puerto Rico vacation by calling 1-800-665-4981 today!